How it begins: "My name is Piper Hadley and I went missing on the last Saturday of the summer holidays three years ago. I didn't disappear completely and I didn't run away, which is what a lot of people thought ... I didn't disappear alone. My best friend Tash was with me. I wish she were here now. The main players: The two missing girls, Piper Hadley and Natasha McBain; clinical psychologist Joe O'Loughlin who's been asked by the Oxford police to consult on a related case; ex-cop Vincent Ruiz who helps Joe with his investigation; and the man who took the girls, a man they call George. My thoughts: Talk about a serendipitous find from the R shelf! I loved this book. It's suspenseful; it's got memorable characters; it's very well-written; and it kept me guessing until the very end, which every good mystery should. The chapters alternate between Piper and Joe as Robotham skillfully weaves together the past and the present. 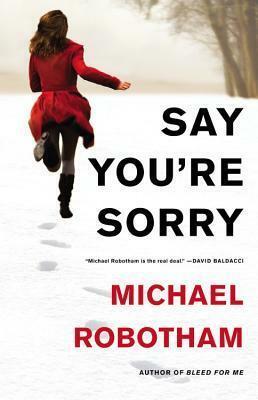 It was in the hopes of stumbling upon amazing novels like Say You're Sorry and even more amazing authors like Michael Robotham that made me start Reading the Alphabet in the first place. I can't wait to read Robotham's other psychological thrillers. I understand Joe O'Loughlin is the main recurring character, which makes me glad because I like him. In fact, I liked everything about this book. I love this series, and I have missed this one. I have to go to the library to return some books and will look for this one. Thanks, Lark. I love when a book just blows you away. I'll admit this one intrigues me. I'll have to go look it up now. If you like suspenseful reads with strong characters this book is a good one! This book grabbed me just like French's books always do; my library day is Friday and I'm planning on checking out another Robotham book. He's a new favorite author. I really enjoyed this one too. I have read a small few of Robotham's books so far and each one was good. Oooh, I'm always looking for good psychological thrillers. I love Tana French, too, so if this author is anything like her ... I'm going to be a big fan :) I'm heading to the library this afternoon - I'll definitely check out the "R" shelf. Thanks for the heads-up!